Presbyterian scholar Ronald P. Byars echoes this sentiment near the beginning of The Sacraments in Biblical Perspective when he observes that the sacraments “testify to the conviction that the knowledge of God involves the mind, indeed—but not only the mind” (p.4). Byars’s wide-ranging and conversational exploration of the relevant biblical texts grows out a lifetime spent teaching liturgical theology and being a lectionary preacher. In light of these experiences, he finds it only natural for Christians to eventually reflect on their participation in the sacramental life of the Church and ask themselves, “What does this all mean? What do these words and actions say about God’s redemption of creation in Christ?” These are deep questions, and developing well-rounded answers takes some time and patience. For those taking this journey, though, Byars makes for a helpful traveling companion. No single text in the Old or New Testament gives an all-encompassing explanation of either sacrament’s significance. According to Byars, this is because “the New Testament traditions about baptism and Eucharist, though shaped primarily in relation to Jesus, have also been informed by a variety of texts in the Old Testament relating to water, bread, wine, drenching, washing, eating, and drinking” (p.16). Therefore, he endeavors to “consider and reflect upon texts from both the Old and New Testaments that provide an angle of vision that may help us to ponder the multidimensional characteristics of both baptism and Eucharist” (p.16). The structure of the book is straightforward enough: after first commenting on the challenge of the sacraments in general, he then looks at scriptural texts and themes related to baptism and spends the rest of the book delving into passages that shed light on the Eucharist. Byars begins exploring the scriptural roots of baptism by examining Jesus’ baptism at the hands of John the Baptist (p.27). This episode, he suggests, formed the primary model for the rite during the first few centuries of the Church. John, the enigmatic prophet in the wilderness, saw his baptism as a call for the people of Israel to prepare for the coming of God’s kingdom and shake off the sins that entangled them. Clearly, John’s baptism shared much in common with Christian baptism. An important difference, though, is that Christians came to also associate baptism with the outpouring of the Holy Spirit. Christian baptism is also explicitly Trinitarian in shape (p.132). Another important way of thinking about baptism comes from the Apostle Paul’s writings. Paul often spoke of baptism as an image of participation in Christ’s death and resurrection (ex. Rom. 6). I myself find this image to be a powerful one. That being said, Byars thinks the predominant metaphor for baptism in the pre-Nicene era was actually that of washing or rebirth, rather than death and resurrection (“womb, rather than tomb,” is the way he phrases it) (p.122). Now, it seems to me that there is actually a sizable amount of overlap between these two emphases. Both, for example, highlight with vivid colors the idea of entering into new life. Baptism is also spoken of in the New Testament as a kind of covenantal seal, analogous to circumcision, and one last image of baptism in the New Testament worth mentioning is the image of stripping off old garments and donning new ones. Byars comments that this image may have had both literal as well as metaphorical significance for the first readers and hearers of the New Testament (pp.146-147). Byars takes a pretty even-handed approach to the topic of infant baptism. He notes that while the New Testament has no explicit examples of children being baptized, it also has no clear examples of adult offspring waiting until a certain age to be baptized (p.170). “The New Testament,” he admits, “may be judged to be silent about the second generation, and that silence has made room for conflict” (p.170). Having said this, Byars goes on to describe some of the arguments made by those who support infant baptism and those who oppose it. While my impression is that Byars leans towards the acceptance of baptizing infants, his irenic tone pays respect to the concerns of both sides in the debate. Some may be disappointed by this, but I actually appreciated it. Turning to the sacrament of the Eucharist, Byars judges the beating pulse of healthy eucharistic theology to be a deep sense of gratitude. In this sacramental meal, Christians respond in thankfulness for God’s good gift of creation, the redemption brought about by Christ’s death and resurrection, and the transforming work of the Holy Spirit in their midst (pp.183-184). Given these deep historical connections, it’s not surprising to find that remembrance has always been a crucial aspect of how Christians participate in the Eucharist. Byars makes an important observation when he states that something is lost if we only associate the Eucharist with the Last Supper (p.249). Instead, Christians should also recall Jesus’ feedings of the multitudes and his post-resurrection meal with the disciples traveling to Emmaus, where over the breaking of bread they suddenly recognized Jesus (p.249). For many Christians, though, breaking bread and drinking wine is more than simply a rememberance of something done long ago in the past. It is also a time of encounter. As Byars puts it, “Christians have from early times testified to their conviction that the risen Christ manifests his presence in the Eucharist” (p.241). Unfortunately, controversies over how Christ is present in the Eucharist have tragically led to divisions in the history of the Church. Byars gives a short account of these debates, focusing especially on the disputes that took place during the time of the Reformation (pp.242-243). Broadly speaking, he takes a generous view that finds it more important to affirm that Christ is truly present than to contend over how this is the case. I think he takes the right course in favoring the type of perspective taken by Calvin. According to Byars, Calvin deeply affirmed Christ’s real presence in the Eucharist, but refrained from “tying that affirmation to any philosophical or metaphysical theory,” preferring instead to view it as a mystery accomplished by the Spirit (p.243). As he did in his discussion of baptism, Byars highlights the past, present, and future dimensions of the Eucharist for his readers. As we have seen, those who celebrate the Eucharist intentionally remember the redemptive acts of God in the past (p.190). In the present, they also faithfully expect that Christ will become present in the meal through the power of the Spirit. Finally, Christians also dwell on the future eschatological dimension of the meal, looking forward to “the wedding feast of the Lamb… in which the risen Lord himself will be both friend and host” (p.305). Byars works hard in The Sacraments in Biblical Perspective to help readers place baptism and Eucharist in the wider context of Scripture. 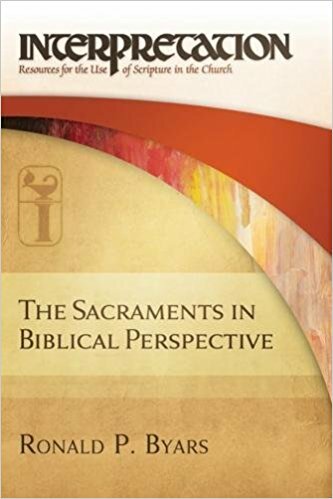 What I most appreciate about this book is that in it Byars helps open the eyes of readers to the fact that discerning the depth and richness present in the sacraments requires being attentive to the broad collection of biblical images, metaphors, and narratives that have been incorporated in their symbolism. When these sacramental acts are considered with a narrower scriptural imagination, I think some of this richness can be missed. Byars also urges readers to remember that baptism and Eucharist are multidimensional, with layers of meaning rooted in the past, present, and future. In my eyes, his exploration of the biblical texts and advocacy of a broader scriptural imagination makes this book a valuable resource, and it’s my hope that it spurs readers of all sorts to probing reflection on their engagement with the rhythms of the Church’s sacramental life. Davis, Ellen F. Preaching the Luminous Word: Biblical Sermons and Homiletical Essays. Grand Rapids, MI: Wm. B. Eerdmans Publishing Co., 2016. This entry was posted in Book Reviews and tagged Baptism, Eucharist, Interpretation, Liturgy, Ronald P. Byars, Sacraments by joecrow91. Bookmark the permalink.